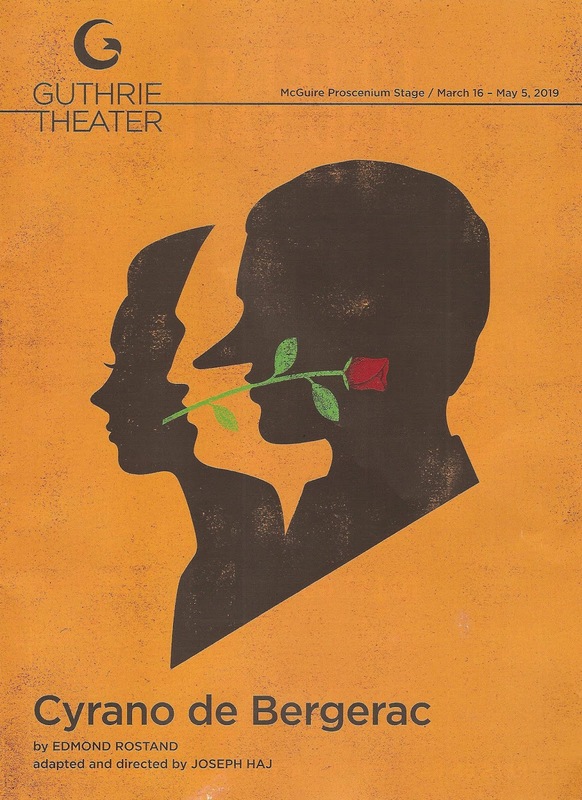 The Guthrie's Artistic Director Joseph Haj brings his adaptation of the classic play Cyrano de Bergerac to the proscenium stage. First produced in 2006 and revised for this production, he based it on the original French and two early English translations, with a goal "to create a well-built, forward-moving story with a steady rhythm that remained in pursuit of what I believed to be Rostand's key theme: the idea that true beauty resides within." Mission accomplished. A dynamic staging, a lovely cast, and inventive design bring this beloved classic to life. The huge cast of 18 actors playing multiple named characters, plus eight "essentials" (a nicer way of saying "extras"), create a fully populated world. There are many familiar faces among the ensemble (e.g., Joel Liestman as the hilariously pompous actor), and some new faces in the lead roles. Theater, TV, and film actor Jay O. Sanders (who looks familiar in that "I know I've seen him in something" sort of way) takes on the title role, and is a true delight, delivering Cyrano's lyrical lines with much emotion. Jennie Greenberry, previously seen on the Guthrie stage in Pericles, is a lovely Roxane, and Robert Lenzi is equally lovely as Christian. Other highlights include #TCTheater favorite Ansa Akyea as the jolly poet/baker Ragueneau, Cameron Folmar as the deliciously smarmy Count also in love with Roxane, and Remy Auberjonois as Cyrano's kind and loyal friend. The large cast never feels crowded or overdone, rather a rich and full world. 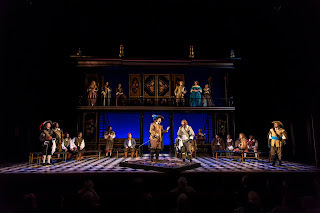 Cyrano's infamous fight against 100 men is wonderfully accomplished by many ensemble members coming in and out to fight Cyrano, spilling off the stage into the aisles and the front row (fight choreography by Kara Wooten). And when a play opens in a theater, it makes sense to use the theater itself, as the director does here (Cyrano's entrance is perfection). 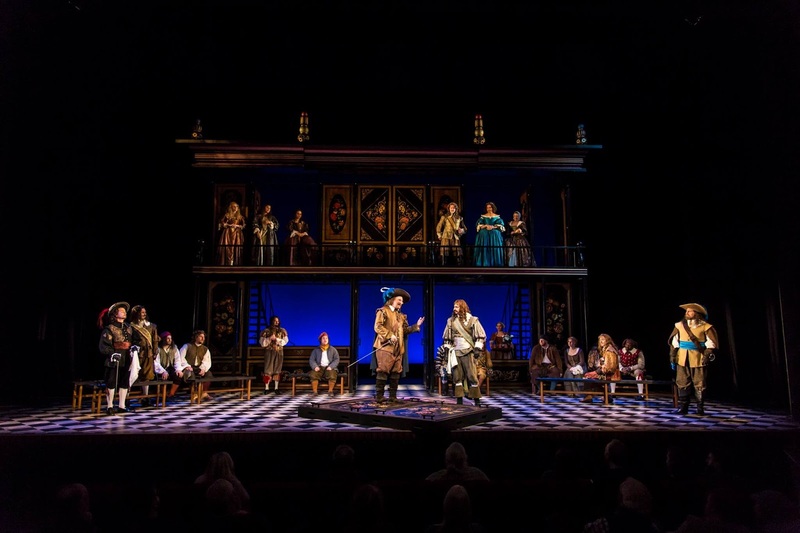 Joseph Haj described scenic designer McKay Coble's set (with whom he worked on the original production) as a "deconstructing curio cabinet," a perfect description for this beautiful, efficient, and delightfully curious set. The two story cabinet is made up of doors, windows, and drawers that open up into different configurations of set that represent the theater, bake shop, and Roxane's home. When I came back from intermission, some sort of devastation appeared to have happened on stage. The richly colored panels are all gone, just a skeleton of the structure in place, the fine furniture covered in dirty cloths, as the men (and a few women) have gone off to war. Jan Chambers' costumes are both lusciously opulent at the court of the first act (Roxane's several dresses are divine! ), and functionally sober in second act wartime. Lastly, the recorded period music (composed by Jack Herrick, sound design by Elisheba Ittoop) is fitting and creates just the right atmosphere. Cyrano de Bergerac is perhaps the best unrequited love story ever told (and I love an unrequited love story), made ever more bittersweet by the fact that Cyrano's love is, unknowingly, requited. Or rather it could be if he could get over his own nose and let it. But who among us doesn't feel there is something about us that makes us unloved and unlovable? Perhaps that's why this story touches us so and doesn't show any signs of going away after 120 years. Cyrano reminds us that everyone is deserving of love, even large-nosed poets and simple-minded soldiers. 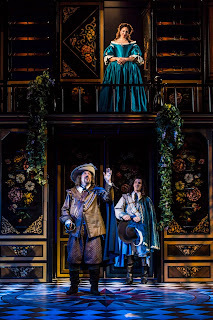 Cyrano de Bergerac continues through May 5. *Plot summary borrowed from what I wrote about Park Square Theatre's 2014 production of Cyrano.